For international customers email info@bmobooks.com.au to see if you are eligible for the $6.00 postage rate for purchase of a single copy of this DVD. Unfortunately the website doesn't automatically apply the discount please email to apply. This DVD features the voice of American Idol finalist Melinda Doolittle as "Cassie Cassava", and also includes the new Silly Song The Hopperena. 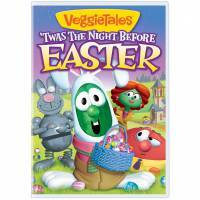 - Larry's backstage pass to "VeggieTales Live!" If you can find what you are looking for please email info@bmobooks.com.au and we will see if we can help you find it.